Here is where the textbooks can be a little lacking because while they do generally explain how to form these verbs, they often do not provide you with full conjugations or a transliteration in the Latin alphabet. Instead, they just give you the basic paradigm and the base Arabic verb. Thus when you meet a new verb in Arabic, before you can conjugate it and use it in a sentence, you have to first determine which of the nine forms or "measures" it belongs to and then whether it is sound, weak, hollow, assimilated, "defective", geminate, hamzated, passive… and then you are on your own to figure out the conjugation, not to mention that the short vowels are not generally indicated in written Arabic. I've always thought that a good way to assimilate Arabic verb tenses would be to learn one verb of each type so that you could use it as a kind of template when you meet a new verb. Arabic verbs are all about patterns of consonants and vowels and once you have learned the pattern for a verb type, the next time you meet another verb of the same kind, you will have a ready-made map or blueprint in your mind to use that verb. 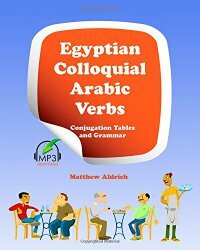 That is why I am glad that I found the book Egyptian Colloquial Arabic Verbs and the corresponding workbook because it provides full conjugations for sample verbs in the various possible combinations. There is also a version available for Modern Standard Arabic Verbs. Thus, for example, there are full templates for a "defective measure III verb", a "hollow measure VII" verb, a "geminate measure X" verb, etc. 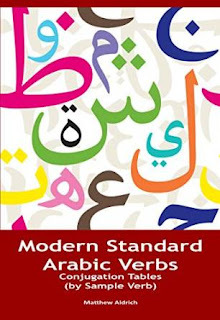 What's great and unique about this book is that it provides the full conjugation in the Arabic script as well as the transliteration in the Latin alphabet. Since the Egyptian Arabic book uses colloquial Arabic, both forms of the imperfect (with and without the "bi-") are provided.